Stock markets in New York and Toronto were sharply lower on Monday, a pullback from a weeks-long rally prompted by the presidency of Donald Trump. 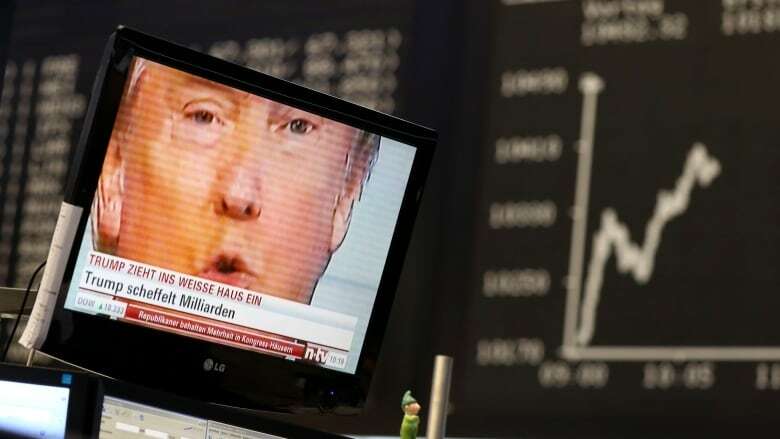 Stock markets in New York and Toronto recovered slightly from midday losses but still closed significantly lower on Monday, a pullback from a weeks-long rally prompted by the presidency of Donald Trump. The S&P/TSX composite index in Toronto closed down 170.69 points, 1.1 per cent, its worst day since the middle of December. "Global markets have a negative risk bias this morning with most of it focused upon equities," Scotiabank said in a note to clients. "Canadian markets will just follow the global tone this morning and for much of the week." The U.S. president outlined his immigration policy on Friday via an executive order to temporarily halt visitors coming to the U.S. from Syria, Iraq, Iran and four other countries on the grounds of national security. That was bad news for just about every global stock market, as the ramifications of isolationism from the world's largest economy spread far and wide. "Last week's enthusiasm in financial markets fizzled over the weekend, as the U.S. travel ban incited worries — and confusion — around the world," BMO economist Jennifer Lee said. Lower oil prices pulled down the TSX energy sub-index by 2.07 per cent, and the heavyweight banking index declined significantly as well. All 10 of the index's 10 main groups were lower on Monday. The Canadian dollar gained 0.10 of a U.S. cent to close at 76.22 cents US. The Dow Jones industrial average had cracked through the 20,000-point barrier for the first time ever last week, but it closed down 122 points on Monday. The S&P 500 closed down 13 points, and the technology-heavy Nasdaq index lost 47 points. "Trump's immigration and trade policies are getting more attention as a downside risk to what markets have priced so far," Scotiabank said. Other analysts believe that traders are simply looking to lock in profits from the market's recent gains. "We had such a run-up here in the markets since [Trump's] election, both in Canada and the U.S., we need some sort of pause," said Ian Nakamoto, an equity analyst with Raymond James.